Craving pancakes for lunch, doughnuts for dinner or a breakfast taco as a midnight snack? 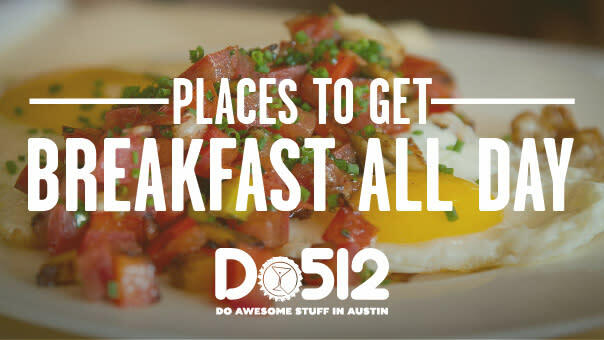 Break the brekkie rules with breakfast all day (and well into the night) from these hot locations around Austin. 24 DINER (open 24 hours) Grab yourself a roasted banana and brown sugar milk shake, stuff your face with the best chicken and waffles you&apos;ll ever have, then wander home knowing you&apos;ll get a good night&apos;s sleep thanks to your amazing food coma. Trust us, you won&apos;t regret it. KERBEY LANE CAFE (open 24 hours) In Austin, many late nights end at Kerbey Lane. Order their famous Kerbey queso (topped with guacamole AND pico de gallo) and be sure to try their eggs Francisco or Pancake of the Day. If you&apos;re lucky, they&apos;ll be featuring their cinnamon roll pancake which is caramelized with brown sugar and topped with ooey, gooey icing. MAGNOLIA CAFE (open 24 hours) Magnolia Cafe is the perfect spot to end your night because it&apos;s right smack dab in the middle of central Austin. Be sure to try their Mag Mud (queso with black beans, avocado and pico de gallo) or an Austin staple, the Migas. And if you don&apos;t think you&apos;ve spent enough money on pointless things yet, you can always purchase one of the pieces of strange stick figure art they have hanging on the walls for a mere $300. LAS CAZUELAS MEXICAN RESTAURANT (open 24 hours Thu-Sun) Las Cazuelas is one of those little gems that will make you look like a hero in front of your friends because not many people know about it (especially tourists). Sit down indoors or outdoors and eat some breakfast tacos. Oh, and don&apos;t forget to top off your tacos with salsa from their fresh salsa bar. LA MEXICANA BAKERY (open 24 hours) If you&apos;ve got a sweet tooth and enough money and energy to catch a bus or cab to La Mexicana Bakery, GO THERE seriously! Try their tres leches or just play eeny, meeny, miny, moe and pick up a little of everything. You really can&apos;t go wrong with anything you order here. STAR SEEDS (open 24 hours) As far as late night eats go, Star Seeds can&apos;t be beat. With an impressive 24-hour menu that boasts burgers, sandwiches, breakfast foods, and a wide variety of other entrees, Star Seeds is a necessity when it comes to Austin diners. They are a locally-owned institution, with their very own coffee blend from Texas Coffee Traders. Plus, they have pie. EL TAQUITO (open late) What better way to avoid a hangover than to fill up on authentic tacos, then wash them down with a refreshing Agua Fresca? If you happen to make it there before 2 a.m., you can end your night with a frozen margarita. MRS. JOHNSON&apos;S BAKERY (open all night) Craving donuts, kolaches or coffee in the middle of the night? Mrs. Johnson is the lady to see. This bakery specializes in late-night, serving from 8:40 p.m. until noon the next day. THE OMELETTRY (open 7 a.m. - 5 p.m.) As the name implies, omelettes are the specialty here. They are prepared with three eggs and a special combination of swiss and cheddar cheese, with your choice of pancakes, homefries, fruit, toast and more. The Omelettry originally opened its doors on Burnet in 1978, and recently moved to a new location on Airport. FULL ENGLISH CAFE (open 9 a.m. - 5 p.m.) Family owned and run since 2010, Full English is a genuine British cafe in South Austin. Go for High Tea and pastries, or a big breakfast of free-range local farm eggs, British-style bacon, proper bangers, pancakes and more. You won&apos;t leave hungry, that is for sure. BOULDIN CREEK CAFE (open 7 a.m. - midnight) In a land where vegetarianism and veganism are not swear words but lifestyles, there lives a little cafe called Bouldin Creek. Home to hippies and hipsters alike, this community mecca serves up a bountiful brunch all day every day of the week. Featuring fresh vegetarian cuisine with hearty servings and the best sake lemonade in town, Bouldin Creek provides a welcoming atmosphere to all. NAU&apos;S ENFIELD DRUG (open 7:30 a.m. - 4:15 p.m.) Nau&apos;s Enfield Drug is home to Austin&apos;s only original full-service drug store, soda fountain, and grill. Nau&apos;s Enfield Drug has been serving West Central Austin since 1951 and has become a beloved, historic landmark. Located in the middle of Clarksville on the corner of 12th & West Lynn, you can stop in to read the local newspaper while enjoying bacon and eggs, huevos rancheros, omelettes, breakfast tacos and more. JUAN IN A MILLION (open 7 a.m. - 3 p.m.) This place has a taco so large it could feed an army. It&apos;s called the Don Juan El Taco Grande, with enough potato, egg and bacon tastiness to share with the whole table. Make sure you&apos;re good and hungry for this one. And don&apos;t forget to order a nice, cold glass of Horchata (sweet rice milk) you&apos;ll thank us later. CURRA&apos;S GRILL (open 7 a.m. - 10 p.m.) The brainchild of owner Jorge Garcia, Curra&apos;s is, simply put, Mexican soul food. The #1 breakfast dish at the restaurant, The Juju Plate, was an original concoction by a frequenter of Curra&apos;s. Egg whites scrambled with veggie chorizo, spinach and mushrooms, topped with avocado slices. Try it with their avocado margarita, if it&apos;s not too early for a drink. TACODELI (open 7 a.m. - 3 p.m.) Since 1999, TacoDeli&apos;s goal has been to offer the best taco in town. They hand make everything in-house daily and use locally sourced, organic and responsibly sourced ingredients. You can build your own breakfast taco, or try a signature taco like The Vaquero, featuring eggs scrambled with grilled corn, roasted poblano & red peppers, and topped with Monterrey Jack cheese. EL CHILITO (open 7 a.m. - 3 p.m.) At El Chilito on Manor, you can enjoy breakfast all day with tacos and burritos featuring farm fresh eggs, and a coffee bar offering fair-trade, organic coffee and Mexican Hot Chocolate. There&apos;s also a wide variety of specials, including classics like Carne Asada, and plenty of vegetarian options to appease the herbivores. RED RIVER CAFE (open 7 a.m. - 3 p.m.) This old-school, campus-area diner offers all-day pancakes, breakfast tacos, omelettes and more. Order up an all-American breakfast, or the "Veggie Quickie" featuring eggs scrambled together with tomato and mushroom, served with hashbrowns or fruit and toast. CISCO&apos;S (open 7 a.m. - 3 p.m.) Cisco&apos;s has been an iconic part of Austin&apos;s history since 1948, when the restaurant was founded by Rudy "Cisco" Cisneros. Over the course of 60 years, Cisco&apos;s has been a family-run establishment offering breakfast favorites like Migas, Huevos Rancheros and a lot more. This place is the stuff legends are made of.